As they planned the home, a target emerged: to have their electricity use be net zero, meaning the amount of electricity used each year roughly equals the amount of renewable electricity created at the house. Solar panels got the Reeds to the magic number. But Laurie, an architect turned art teacher, didn’t stop there. 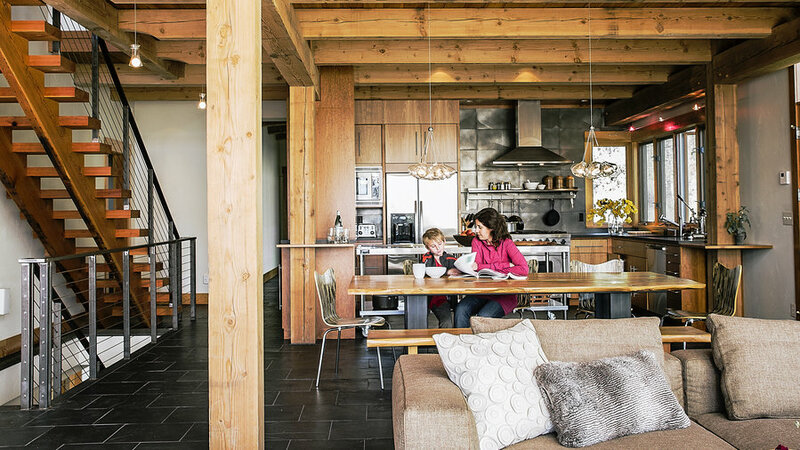 On her list of musts: a metal roof (to eliminate the pollution an asphalt roof would add); soy and denim insulation; and reclaimed materials, inside and out. 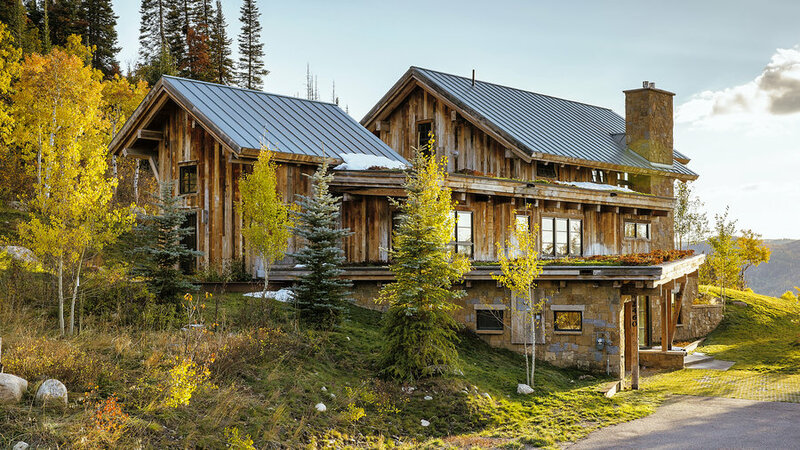 Project designer Jeff Gerber’s challenge was fashioning the home’s intricate post-and-beam structure, fitting together the massive trestles (salvaged from Utah’s Great Salt Lake) with expanses of glass. 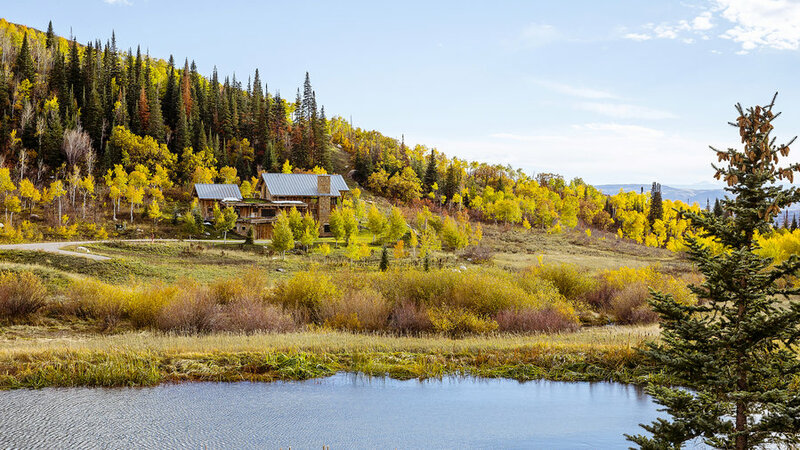 During the process, a surprise storm dropped 400 inches of snow in Steamboat, filling the not-yet-roofed home. Eventually, the snow was cleared, the roofs went on, and the house came together. Reclaimed barn siding covers some interior and exterior walls, and stacked stones root the house into the rocky landscape. The furniture is so low profile, you barely notice it. “My philosophy is to let the ingredients in the house be the decoration,” says Laurie. “In a setting like this, the house needs to be quiet, and the landscape becomes the real monument.” The Reeds even pulled the landscape up on to the house: Along the roofs, carpets of sedum plants replace, in part, the green space that was taken away during building. 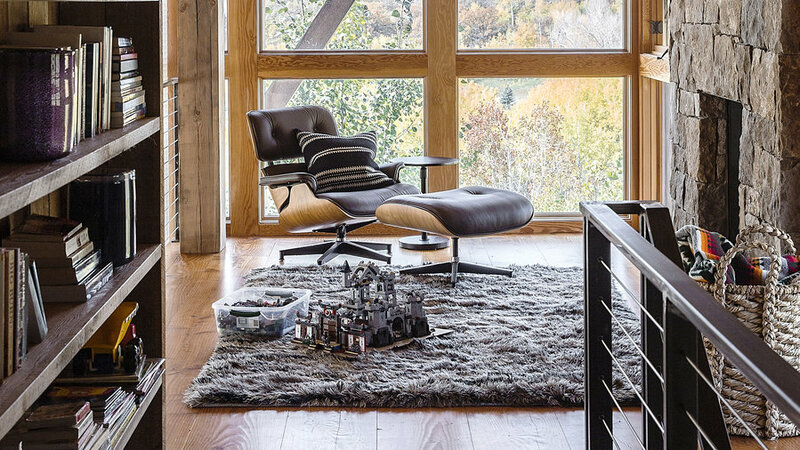 This open-plan space is a study in contrasts. 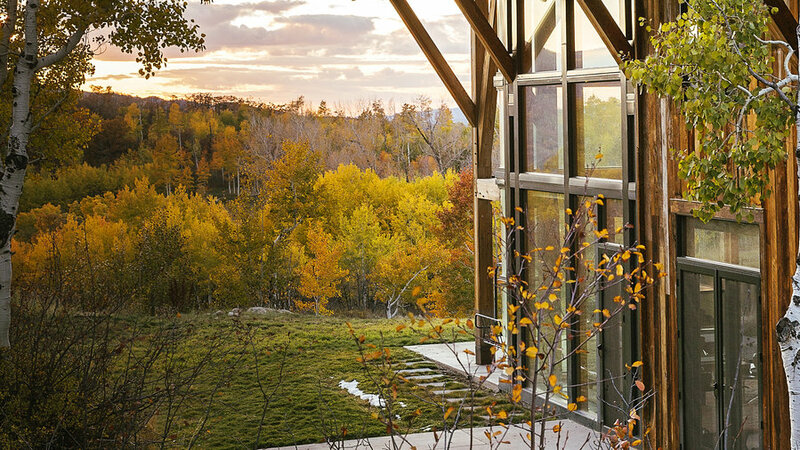 Rustic salvaged trestles and reclaimed wood siding are offset by expanses of glass. Against the stone fireplace surround, which extends all the way up to the second floor, clean-lined furnishings and a globe light fixture keep the space modern. A pair of ski boots serves as art on the mantel. “I wanted a kitchen that simply performed its function and didn’t draw attention to itself,” says Laurie. She originally designed a wooden island for the space, but the cost was prohibitive. For a tenth of the price, she found this restaurant-style table online, which plays to the industrial touches elsewhere in the house. Laurie thought about a stainless steel backsplash, but it was too austere when paired with the rolling peninsula. 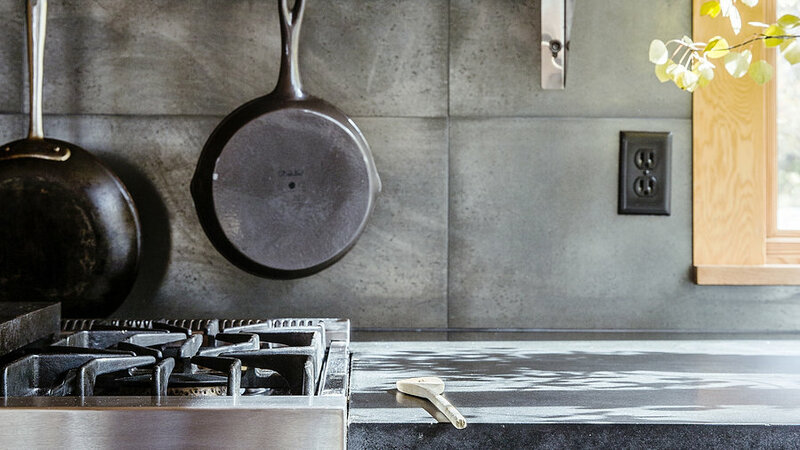 She found these Ann Sacks tiles that were just earthy enough to play to the honed black granite counters and stone floor pavers in the kitchen. 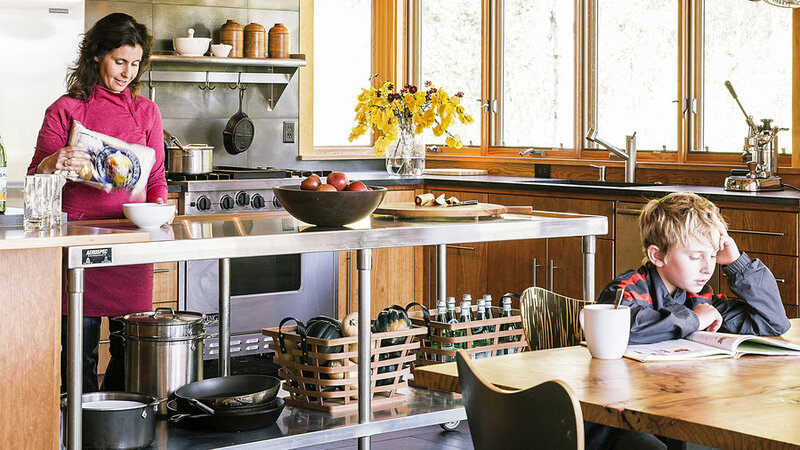 An open shelf features a well-placed pot rack for easy access. 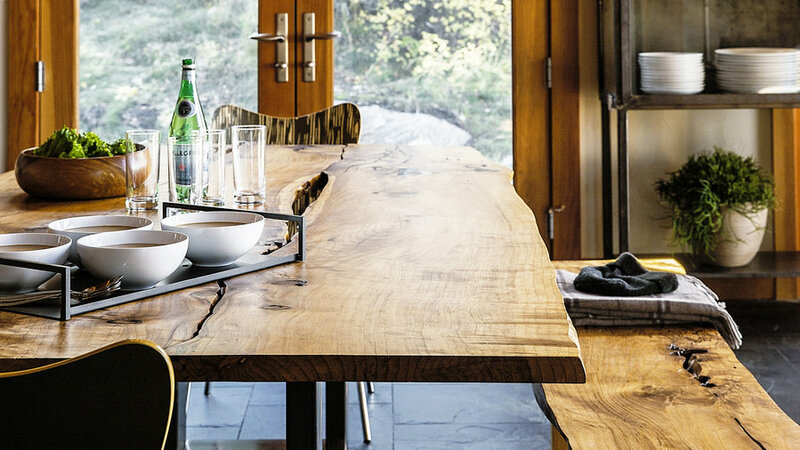 Laurie and Dave chose their redwood dining table and bench from Meyer Wells in Seattle, a company that repurposes felled trees as furniture. Also repurposed: the vintage medical cabinet, which they use to store china. High ceilings in the master bedroom made room for a loft, which serves as a quiet home office. 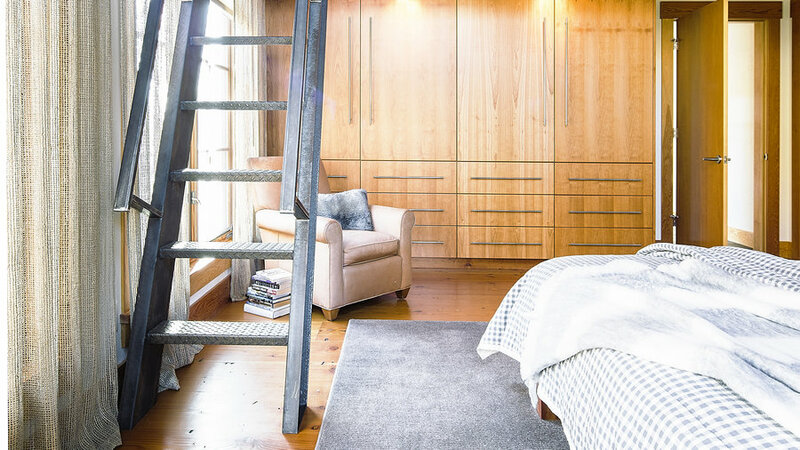 The cherrywood of the closet doors was positioned with the grain moving vertically to mimic the upward growth of the trees outside. 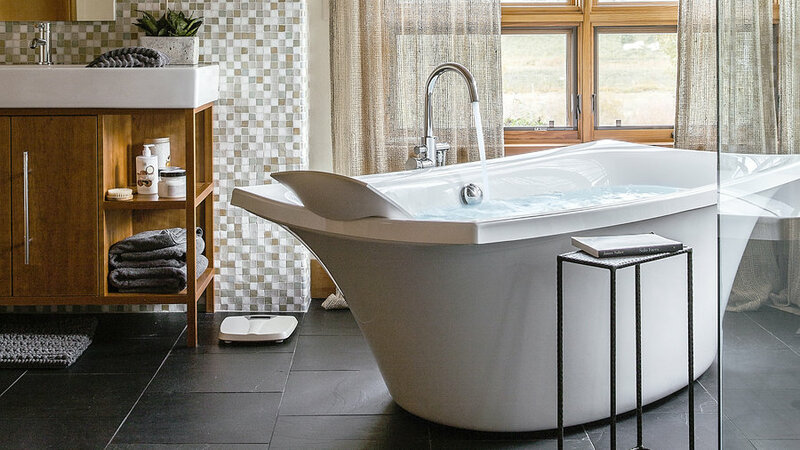 “I think of our bathroom as my study,” says Laurie, who keeps threatening to put a desk in there because she’s so drawn to its natural light and breathtaking views. “I take a bath every day, and I devour all my books in there,” she says. The backsplash—which covers the vanity wall—is made of recycled beach glass tile. The floors are simple stone pavers. “I wanted to make sure the wet lands beneath our house were protected, so I insisted on a metal roof,” says Laurie. “Asphalt roofs are terrible pollutants, and wood is too big of a fire hazard here.” Solar panels clip on the metal roofs and generate the family’s yearly energy needs. 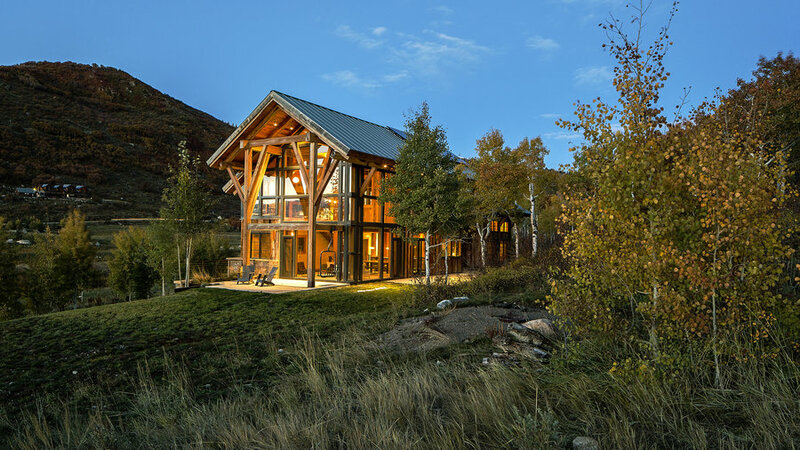 Natural, “Adobe Chopped” stone and reclaimed, mixed (reclaimed) hardwood siding allows the home to better blend into the landscape.